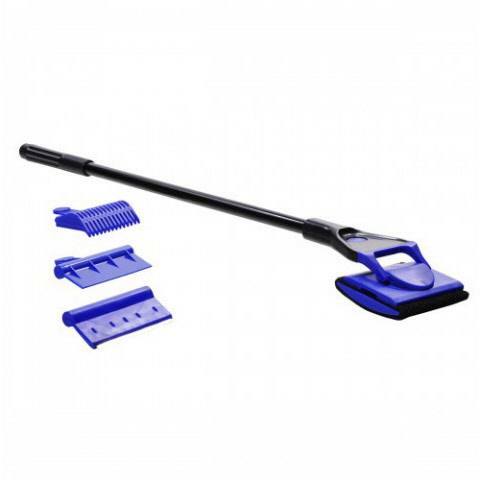 The Aquascraper from JBJ is an adaptable 4 in 1 cleaning kit. This ingenious maintenance tool eliminates the need for multiple products by including 4 different interchangeable attachments in 1 compact unit. This is offered in a 24" handle length to remove algae in the deepest aquariums without ever getting your hands wet. The ideal tool to compliment any size aquarium for fast and easy cleaning and upkeep. Coralline algae scraper (acrylic tanks) easily scrape hard to remove calcium-based coralline algae off acrylic tanks without the fear of scratching. Our plastic scraper is 3" wide and angled to give you excellent leverage against the most stubborn algae. Stainless steel scraper (glass tanks) easily scrape all types of algae off glass walls. Our stainless steel scraper is 3" wide and positioned to give you the perfect leverage against the most stubborn algaes. Rotational polisher removes algae off glass or acrylic aquariums with a convenient head that rotates to get to hard-to-clean areas. Gravel shovel is the perfect tool to sift sand or gravel while keeping your hands dry. Easily remove empty snail shells or other waste out of the aquarium.